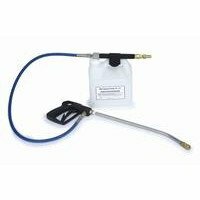 The Prochem Pressure Washing Gun comes with fan jet and needle jet. The NEW Prochem Power Burst is a new formula enzyme-free high performance alkaline detergent pre-spray for pre-cleaning heavy soiled commercial carpets. The Prochem Power Burst is ideal for greasy restaurant carpets and traffic lanes where there is high build up of grease. Prochem Power Burst can be pre-diluted for use in hydro-force sprayers. Not suitable for wool or wool-mix carpets. White powder with floral fragrance. The Prochem Hydro-Force Injection Sprayer is a high pressure 250 - 1000 psi 1 to 8 dilution injection sprayer.